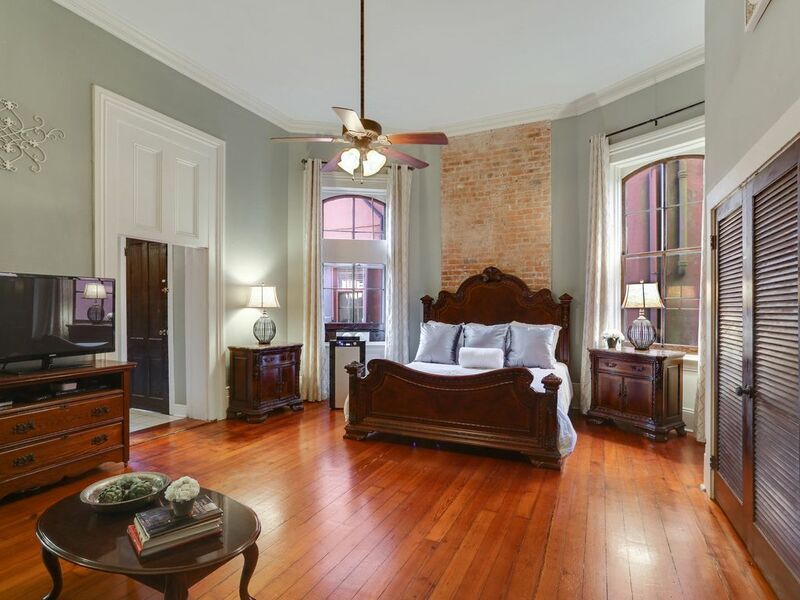 The Southern Charm suite is an extraordinary, fully renovated suite featuring an open floor plan on the ground floor of a restored historic 1850s building. The 14-foot ceilings, exposed brick, and hardwood floors gracefully marries old world craftsmanship with modern conveniences. The luxuriously large living space includes a king-sized bed, 42" flat screen television, and full-sized convertible sofa. A modern galley-style kitchen with granite countertops is fully equipped with a stove, microwave, refrigerator, and toaster. The suite also features direct access onto a semi-private patio. The condo has a brand new heat/AC unit. The Southern Charm Suite is located on the quiet, residential side of the French Quarter. Enjoy all the city has to offer during the day, and rest soundly at night...or the other way around.From our location, it is easy to enjoy New Orleans as a local and take an evening stroll down Esplanade Avenue, before heading off to one of the superb Creole restaurants or Jazz clubs. Exploring the French Quarter's extraordinary architecture or wandering through the stalls of the French Market are just steps away from your front door. We are available 24/7 for any emergencies that may arise during your stay. You can stay and feel comfortable knowing we are there for you if you need us. Our property is a well cared for refuge in our beloved city. It is uniquely located on Bourbon Street and close to Frenchman Street yet on a quiet residential side of the French Quarter. So you can enjoy all the city has to offer during the day, and rest soundly at night...or the other way around! Location! This unit is situated right between Bourbon and Frenchman Streets. It is also within walking distance of all New Orleans downtown attractions. Yet it is in the quiet residential Marigny. You can't find a better place to call home while enjoying the Big Easy! Washer and Dryer are coin operated and located on premises. The property has free WIFI. Was pleased that property was within walking distance to all attractions we were interested in but far enough away from nightly noise. Quaint old building. Had everything we needed in room. Kitchen was clean and had all necessary utilities to cook in if we had chosen to. Would definitely recommend to people. We loved the apartment, it was clean and cozy. The location is ideal, close enough to walk every where but also far enough that you can sleep without the crazy noise. Great location. Comfortable bed and room had great character. There is a musty smelling hallway. Good. We enjoyed our stay even though we could hear the neighbors right outside the shower. A little noisy. Mold in the shower and not very clean, but great location. I have to say, the property is very well located and is very cute, but not very clean. Eric left very detailed instructions on how to enter the apartment.. Once we opened the door, and looked around, it looked just like the photos. Then you notice dust all over the louvers, clock and lamps unplugged and the shower curtain and the inside of the toilet had mold (disgusting). A/C-Heat and TV, had no instructions on how to operate. We were able to figure out the TV to remote system, but the A/C-Heat, we could never stop from changing speeds and temperature. The bed was very comfortable, the kitchen was well equipped and the shower had plenty of hot water and pressure, but once again it had mold. The apartment would have been worth the price, if it was clean and did I mention their is an added cleaning fee and you get mold and dust? We strive for excellence and always also leave 24/7 cell number for any issues which we resolve within minutes. Can’t apologize enough for less than satisfactory stay and wish we would have been immediately contacted to remedy ASAP as we are inside the building daily, am and pm. Thank you for the opportunity to investigate and correct all items mentioned and so sorry you weren’t able to immediately report so we may have immediately corrected. I travelled with a lady friend and stayed in this suite and it was wonderful. The aesthetics were gorgeous (high ceilings, nice wood floor, very comfortable bed). We enjoyed the private patio that overlooked Esplanade. We honestly didn't spend too much time in the actual suite since we're in New Orleans running around all day - but you couldn't ask for a better location for sure. Right between the French Quarter and Marigny walking distance from everything but very quiet. It's great to go shopping and pop back by to drop things off or take a disco nap or just relax one's feet for a bit. Eric was very responsive and accommodating and flexible with our various arrival and departure times. Instructions were very clearly communicated. We very much enjoyed our stay and would consider staying there again! It was just as advertised! The room was just what we wanted. This property is close but not too close to the French Quarter. Great location. We did not rent a car. We walked 30 miles for the week we were here. Eric Bay was very helpful and communicated on a regular basis. CANCELLATION/REFUND POLICY: The rental charges are fully refundable if you cancel your reservation 60 days prior to your arrival. If you cancel after that date, we will refund the damage deposit and cleaning fee, but the rental charges are nonrefundable unless we are able to rebook the property for the dates you have reserved.